As The Tarot Donkey, it matters to me what impact my business has on our beautiful home. 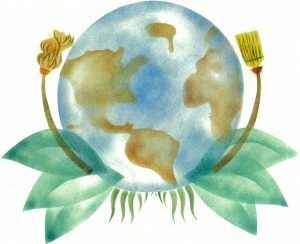 Caring for the Earth is not a business shtick for me. I also try to do my part in my personal life as well including replacing napkins, facial tissues, and moon time products with reusable cloth; not using harmful fertilizers or weed killers in my yard or garden; supporting small businesses who also care about our planet; and overall striving to reduce, reuse, and recycle. Click here to return to the shop.